F8DZY "Ham Radio only...": E31A Eritrea, the chase ! E31A Eritrea, the chase ! Hi, E31A team hits the bands since some days. Eritrea is already confirmed on several bands including 6M here so, not in hurry. Despite the big piles, the ops usually listen to a short split and use their filters & good ears. In 3 days, I could log them on 15M CW (new slot), 17M CW, 160M CW (new band), 40M SSB (new slot), 80M CW (new band) & 30M CW (new band) ! 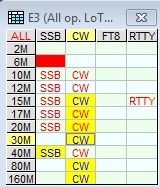 All bands are filled from 6M to 160M, I don't ask anymore ! Thanks to the team for their excellent job there ! VK9AR IOTA OC-216 Ashmore Reef in the mail !